Next week we'll see broken heart couple. I just realized both Geum and Ok Nam are crying. Does this mean we have to endure watching another hour long of Geumi suffer again in Episode 11?? @paw22 Possibly...but I don't trust the preview anymore. Eventhough we'll see Geum's crying, I think the plot is going to be favorable for Geum since Ok Nam is crying for Geum. Jung will find out that she's having a brokenheart because of Geum.. Jung also will find out that Geum can see Jung's apparition and makes him realize that he's indeed the lady in red who demanded for revenge and also the deer that asked him to repent. I really hope more Doki doki moment for Geum and Ok nam. The scene where Ok Nam is with Geum, just two of them in the car makes me full of hope. I wish they do some parents moment! LOL it's possible they look for their naughty tiger who run away with her mischief date. Time for Jeom Soom get some lesson from mommy and daddy. I hope you're right. I hope that the K-netz sentiments have reached the production and they'd reconcile whatever conflicts between the characters before the 12th episode (since typical k-drama plots in a 16-episode series dictates that episode 12 should be the episode of where characters realizes things, an awakening to the characters' main thoughts and feelings). I'm also dying to watch both KG and ON being mama and papa bears to Jeom Seon. [REQ] Mama Fairy and the Woodcutter is tvN's 'painful finger'? New article translated by melohwa! Ep 1 & 2 of 'Mama Fairy' was poorly made. The CG was awkward, directing is distracting, and the one-dimensional male lead's character. But the romance between Sun Ok Nam and Kim Kim from ep 5 onwards made it interesting. There may be childish parts, and there are as much side stories as the main stories, but it feels warm and pretty watching the lovely fairy and affectionate straightforward man." Kim Kim, have faith in you wifeu! The way Geum looks at her, it's electric. I am looking forward to SJH getting older and getting more mature roles. I thought I was going to hate the Professor but no! I really feel sorry for him. To whoever that says Yoon Hyun Min can't act and can't give justice to his role, that's not true, for the past episodes I see how his acting grows in this drama and as the story unfolds his past reincarnations, I really felt the sincerity of his character. And for this episode, he is charismatic enough that instead of searching for more Geum-Nam moments, I see through his character. Though I love Geum and I am clearly smitten with Geum, and I honestly believe, even from the start that he must be the husband, it didn't stop me from silently hoping for the past few episodes that the love between the Professor and Ok Nam might blossom somehow just like what the red fairy said last episode. So now... I want to know how everything else will be unfolded since we are already in episode 10. Fighting! Anyway, this episode is fun and the scene where Professor Jung is driving too fast and Geum running for them is really cute haha! Just has read this article: https://melohwa.blogspot.com/2018/12/req-mama-fairy-and-woodcutter-is-tvns.html?m=1 thank you @hazelyeot for sharing this! Article talks about viewers having lots of expectations for 'Mama Fairy', so it has 5% ratings for the first 2 episodes. But it fell quickly to 3% for the 3rd episode. '100 Days My Prince', the drama before this recorded ratings of 14.4%. tvN plans to cover all nights with its dramas along with 'Boyfriend' and 'Memories of Alhambra' but it looks like there's a 'flaw' in this plan. Competition in the same timeslot is fierce with SBS's 'He Hymn of Death' 7.8%, jTBC 'Clean With Passion For Now' with a successful soft landing of 3.5% on the first and second episode. Easiest reason for it is because there isn't a big star. 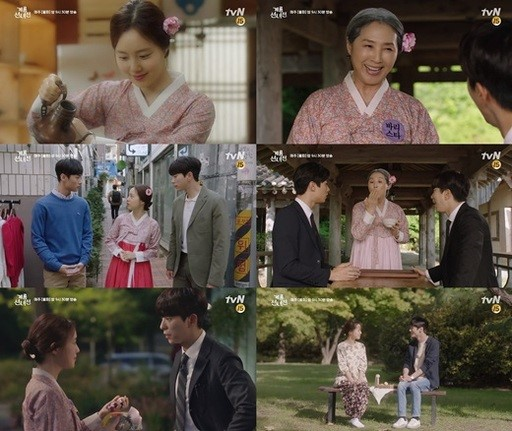 Although Moon Chae Won, Yoon Hyun Min, Ko Du Shim, Seo Ji Hoon, Ahn Young Mi showed stable acting performances, it's hard to compete with stars in 'Boyfriend' and 'Memories of Alhambra'. But this shouldn't be an excuse since '100 Days My Prince' is a hit without huge stars. This is making viewers who are working hard to watch the drama discouraged. Which drama has a soft landing of 3% and which one is a fail? The drama that has a soft landing mentioned has 3.3% ratings, why is it reported as 3.5%? 3.5% ratings is the current ratings for the drama that the article is being sarcastic about. Even if that's the case, articles should be factually correct. The drama before may be a hit or the previous-previous drama has 1-2% ratings. To add, Mondays and Tuesdays are the only days with 5 dramas competing with each other. Take these points into consideration too. Moon Chae Won is pretty and lovely, so I'm watching this. But I'm thinking that the rookie male actor is not bad too these days. I find this interesting. It's so much better than makjang dramas. I like it, it's pretty, and acting is good. Ep 1 & 2 of 'Mama Fairy' was poorly made. The CG was awkward, directing is distracting, and the one-dimensional male lead's character. But the romance between Sun Ok Nam and Kim Kim from ep 5 onwards made it interesting. There may be childish parts, and there are as much side stories as the main stories, but it feels warm and pretty watching the lovely fairy and affectionate straightforward man. It's fun, why are they acting this way? The female lead's lovely beauty is hard carrying this. I find it interesting.. The childish CG is cute... Fairy-nim's tone is pretty... Don't put actors down with these useless articles.. What do you mean the painful finger..? The reporter's finger should hurt. Moon Chae Won kept wearing the flower-pattern hanbok throughout the whole of ep 8, her beauty turned such an old-fashioned hanbok into clothes that fairies wear. Her voice is pretty too. The way she speaks in Hao-che [t/n: Korean speech levels] is addictive too. It's a warm drama. Moon Chae Won is so pretty. It feels like a fairy is taking on a fairy role. I agree with viewers! Why they are keeping these kind of articles anyway? A lot of viewers are enjoying the drama and I can't even finish my projects since I felt the insanely need to watch this. This drama from the very first start is having a critical time because of diverse opinions. I absolutely think even though there maybe some expectations not met, this drama is indeed good, light hearted, confusing (in a good way) and is very lovely. And although, the ratings weren't that insanely high, I think it was not the really bad. For episode 10 it has 3.89 ratings nationwide and 4.1 ratings on seoul. I even plan to rewatch this on my Christmas vacation. I really want to rant because it is frustrating that there are such negative reviews from people who don't even give this drama a chance. By the way, from where I'm watching this drama, there are actually quite good comments per episode and so many theories that were fascinating. By the way, here's kimkim's new posted pic on his IG! @aoikarin HAHA it would be an indeed mind-blown twist if the Master of the Northern Star is Geum's mother! Reading that article about dramas low ratings made me want to say something. sure it is ok to talk about failure in making it a hit drama. ratings is talking for itself. but like comment is saying the article is writing based on wrong assumption. consider there is many dramas airing true the week, and also people have other real life thing to tend to. sadly not every drama gonna be hit to the masses.. to me even tough a drama have low ratings do not gonna make me shy away from it. To me the more important thing is if I myself is liking the story and character. That's what I thought so also, It'd be super daebak to know that Master of Northern Star is the Geumi's Mother. My speculations also is that maybe the Master is disguised as JS's boyfriend or Dr. Lee. I don't know who know is the Master at this point since there are so many side characters and stories that. This betrays thing between Izy and Pa geun Seong made me think, what if it just in Izy perception. pa geun seong never betray her but she felt being betrayed just because pa geun seong doing the right thing that according to izy is wrong. I cannot shy away how Pa geung seong facial expression when he saw Izy being punished out from fairy realm. It's like a face that says "why are you doing that. now you have to get the punishment. But I'm your friend, i cannot just stand and let you get the punishment"
Based on izy character that goes whatever she wanted and her temperament also. That alone one day can cause a trouble for her, that is banished from fairy realm. This hatred thing lead to she "remember her past life as a deer" says "you have to be careful with the guy that life in your house" to Seon Ok Nam. At this time, pa geun seong who goes to the human world didn't remember anything. after izy being banished, she turns into deer. and pa geung seong asked to Nothern star god to be banished in the human world. he lost his power and memory, so his hair turn into black. that is why he as bausae has the same face as pa geun seong and Ok Nam recognizes him. Guyyys! Is this Seo Ji Hoon's official twitter account? I found this thread on twitter! He is so awesome!!!! Okay, now I am on Episode 3, ha ha..and reading all the comments here before watching kind of helps me to keep in mind all the hints and whatnots, I don't wanna miss anything. Though I was already spoiled on most parts of the stories and who ends up with who, I think from the very beginning, I'm already leaning towards Geumie^^. Watching episode 1, I think it's already hinted who the husband might be?..ha ha..
1. When Geum said, "Next time, I'm taking my wife anyway" after Jung said he's only going once to his hometown. 2. Geum narrated, "Is it because the moon is bright? I caught a glimpse of her shadow, but it seemed to be dancing as if it'd soon take flight". 3. His hometown is Gyeryong. I also love all of you guys' comments and thoughts referring to who the husband is. Since it was already indicated in the webtoon, then I don't think they would change it in the drama, right? Because it doesn't do justice to the webtoon itself, unless they said it was just based or inspired by the webtoon only, then perhaps the ending might be different. So how close thus far are the events in the drama from the webtoon?^^. It's translated: Kim Geum who witnessed the kiss of Ok Nam and Lee Hyun, is in shock. Lee Hyun gets closer to Oknam so it's hard for him to feel like leaving Ok Nam. OOooohhh!! So the plot will follow webtoon. After the kiss, Ok Nam will realize hat Lee Hyun is not the one and she'll go back to Fairy Cafe. Kim Geum will have another episode of hard time as he misses her like crazy. Finally, I watched the whole ep 10. I really think that they gave some hints about the identity of Geum's mom from the scenes of three fairies. Fairy Oh, Master Gu, and wizard Park feels that Geum's house (funny that they called it "GEUM's House instead of Jung's House) is really homey. I think 1 of the reason is because it is full of Fairy's touch. Everyone who lives in the house is definitely from fairy realm. Secondly, Geum's mom cooks and takes care of them, just like a guardian is taking care of the lost fairies. Third, when dr. Lee couldn't comprehend all of them are fairies, Geum's mom didn't look surprise at all. Fourth, when Geum's mom tried to answer the quiz from Fairy Oh, but Fairy Oh asked her whether she's a fairy.. She didn't say anything. But maybe my guess could also wrong. . Geum's mom has nothing to do with the fairy realm. Because she's having a crush on Master Gu.. she doesn't know about Fairy Seon Ok Nam. Fairy Oh is talking about Jeom Soon that she's giving a headache to her mom since she's raised without her daddy. I think ep 11 Jeom soon will create a trouble with the creepy guy. I need Geum to act like her daddy "again".. Another Daddy-daughter time Please!! @aoikarin thanks for the info.. I hope there isn't painful n angst scenes of Kim Guem n Ok Nam until the last moment.. I want to see some warm moments between them..
@Erika Song that twitter account is a fan account. I talked to the admin though. That account is great and managed by dedicated admin..